Feel at home with modern comforts and warm hospitality at the Embassy Suites by Hilton - Baltimore Inner Harbor. Our stylish all-suite hotel is perfect for extended vacations or short business trips in Baltimore Maryland. Settle into a spacious suite and enjoy homelike comforts including a fully equipped kitchenette 37-inch HDTV and complimentary high-speed internet access. Hold an impromptu meeting in the separate living area or simply relax with coffee and order a delicious meal from room service for the ultimate convenience. Start each day with a complimentary made-to-order breakfast at our downtown Baltimore hotel. In the evening join guests for our complimentary Evening Reception* and enjoy beverages and snacks in a relaxed and friendly atmosphere. After a long day of attending meetings at The Grand or an exciting day discovering Baltimore attractions de-stress with an invigorating workout in the fitness center or enjoy a complimentary beverage and snack at the Evening Reception. 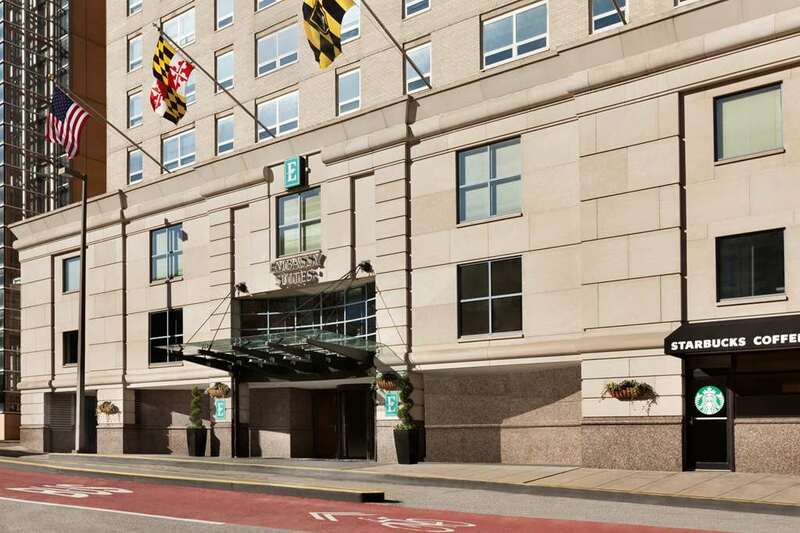 Whether you are here on business or just to get away from it all the Embassy Suites by Hilton - Baltimore Inner Harbor offers all you need and more. *Service of alcohol subject to state and local laws. Must be of legal drinking age. Starbucks: Starbucks serves hot and cold beverages whole-bean coffee microground instant coffee full-leaf teas pastries snacks packaged food items hot and cold sandwiches mugs and tumblers. STACKS Bar - Grill: Whether a fresh salad over a business lunch a delicious Grilled Cheese Sandwich with the family or just a quick bite at the bar to go with your beer STACKS Bar - Grill offers a familiar and inviting atmosphere with classic American dishes.